It’s BBQ season in Australia and contrary to popular belief, there are other things to be thrown on the grill other than shrimp. Here’s a delicious way to cook lamb. The Indians would cook this in their tandoor, but seeing as I am yet to enter the realms of tandoor cooking I use the BBQ instead. It’s pretty delicious anyway. A lot of Indians will add red food colouring to this marinade to give it the bright red appearance. Personally I don’t mind leaving it out but if you want to use it then add it very sparingly. 1kg lamb chops or steaks etc. Using a pestle and mortar, crush the shallots, garlic and ginger together into a paste. Mix in well the yoghurt then all the remaining ingredients. Place the lamb in a large plastic bag, then pour in the marinade. Coat all the lamb in the marinade, seal the bag and refrigerate overnight or at least 2 hours to let the meat tenderise. 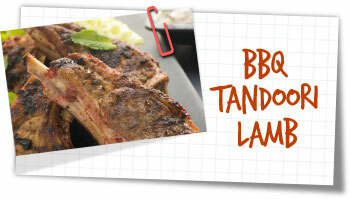 Heat a BBQ til hot, then remove the lamb from the marinade. Place on the BBQ and cook briefly on both sides. Brush with oil or ghee to keep moist until cooked to your liking. Serve hot with vegetables or salad, Indian breads and a nice mint yoghurt raita.